What do you do when you want to vape? Do you fiddle with building coils and make sure that the cotton is still good to use? Or do you just want to pick up your preset vape and just take a long, smooth drag? For people who like the simple life without all the unnecessary bells and whistles, the Uwell Crown sub-ohm tank is the best. The first tank atomizers with replaceable coil heads started popping up in 2014. They were quite revolutionary back then. This was before the founding of Uwell. Sure, they were relatively easier to use than clearomizers with RBA bases. However, they still did have some issues. Then, Uwell came into the scene. And, they came out swinging. As a result, they became an overnight sensation with their first sub-ohm tank, the Crown. Even though the OG crown is two years old now, it is still considered as one of the best sub-ohm tanks today. This is because Uwell addressed all of the problems that earlier tanks had. Therefore, they improved on them big time. Before we go overboard with the praises for the OG Uwell Crown, let’s dive down and take a closer look at it. The Uwell Crown comes has four color options. They are stainless steel, rose gold, black, and iridescent black. The black finish on the Crown is very durable. Therefore, it will not chip easily and you can use throw it into an ultrasonic cleaner and it will not fade. There is also a removable RBA base for the Uwell Crown, but you have to purchase it separately. This is for those who are not fond of replacement coil heads, and would rather fiddle around with their own coils and wicking. The Uwell Crown measures 22mm at the base, which is on the small side by today’s standards. However, this also means that it can fit on all kinds of mods, even the single 18650 ones that are quite narrow. From the base to the tip of the included drip tip, the Crown measures 74mm. The tank holds up to 4ml of liquid, which is which can last quite a long time with normal use. However, the thing that made the Crown so popular among vapers is it was among the first ones that have a convenient top fill design. With the other sub-ohm tanks that came before the Uwell Crown, you had to remove them from the mod. This means unscrewing the base and filling the tank from the bottom. In fact, this was usually quite messy because back then, the glass tanks were only secured with O-rings. The Crown was one of the first to come with the removable top cap and top fill ports, which made life so much easier. The airflow control ring on the base of the Uwell Crown protrudes by 1mm and has knurling on it. This makes it easier to grip and adjust. Speaking of adjustment, the AFC ring clicks into four settings quite nicely. Actually, they are not so hard that you have to force the ring to turn. However, they are also not so loose that it would accidentally spin out of place if you place it in your pocket or bag. This ergonomic AFC design is actually one of the things that I found lacking in most of the sub-ohm tanks and RTAs these days. 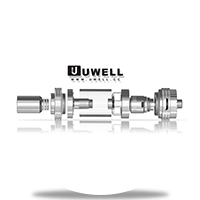 The ability to replace coil heads was another innovation that the Uwell Crown introduced in the market. This meant you did not need to dump all of the remaining liquid in the tank. The base of the Crown can unscrew from the rest of the tank so you can easily access the coil head. This is because the shaft/chimney section has two parts that screw on together and keeps the quartz glass tube in place. Therefore, even if you take off the base, as long as the top cap is on the tank, you can turn the entire thing over without spilling any juice. Back in 2015, the technology of sub-ohm tanks was just in its infancy. Back then, replacement coils used Ni200 food-grade wires. It’s because that was the only usable coils on TC devices. Then, Uwell changed the game. They introduced the first replacement coil heads using stainless steel instead of the usual nichrome. Consequently, it was quite an improvement. For one thing, the stainless steel allowed the use of the Crown on temperature control and variable voltage/wattage devices. As a result, there was no more risk of draining the battery too quickly. In addition, stainless steel coils produced a vapor that is cleaner-tasting, and more flavorful than Ni200. Another improvement that the Uwell Crown’s replacement coils had over the competition back then was that they used two coils in parallel. This meant that the coils can achieve lower resistances. This way, you can pump more watts into them so they can produce more vapor. How Does the Tank Perform? Even by today’s standards, the Uwell Crown subtank still performs like a champ. When the user opens the airflow all the way up, you can take a nice, slightly resistive direct to lung hit. In addition, on the lowest setting, you can also use the Crown as an MTL atomizer because of its comfortably tight draw. The stainless steel coils are certainly a huge improvement over the Ni200 ones. As a result, you can get more flavor and vapor production on them and you can use them both on TC and VV/VW devices. However, the 510 pin on the bottom does not protrude enough for use on a hybrid mech mod. Actually, it barely sticks out of the base screw. However, as always, you should never even think about using a sub-ohm tank on anything other than a regulated mod. Using and maintaining the Uwell Crown is also a breeze. The top fill and bottom fill design of the tank makes it so much easier to refill the tank with juice. However, I don’t really get why there’s a bottom fill option. It seems kind of redundant seeing as it is a whole lot easier to fill the tank using the top fill method. I guess Uwell just thought that it would be nice if people had different options. Performance-wise, the Uwell Crown and its coil heads can still keep up with the rest of the present-day sub-ohm tanks. It produces a decent amount of vapor, and its flavor production is still on point. Another feature that we really enjoyed about this tank (in addition to the features mentioned above) is how extremely easy it is to take apart and clean. The kit already includes most major replacements you’ll need, and with enough variety to experiment with them as you go. This tank is compatible with most major mods on the market, so you won’t run out of options when you’re trying to look for the perfect combo. Sleek and compact design. Even though the tank is quite tall, it does hold a lot of liquid. The Crown coil heads produce clean and flavorful clouds. The AFC ring is ergonomically-designed. The quartz-glass tank works as advertised; it does not get overly warm even when chain-vaping. They did not include the RBA base in the kit. It would have been much better if they included it instead of making it a separate purchase. The included drip tip is a bit too tall and it does still heat up when chain-vaping. 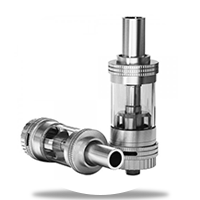 When it first came out, the Uwell Crown subtank was quite revolutionary. They introduced the stainless steel coil heads. In addition, they had the best top fill design of all the early sub-ohm tanks. The construction quality of the Uwell Crown is excellent. The tank feels solid and the machining quality is top-notch. This means that there are no burrs or sharp edges whatsoever. Do you want to experience one of the best sub-ohm tanks that has ever graced the vaping industry? Then, I highly recommend the Uwell Crown subtank. You don’t have to look too hard, we have you covered; here’s a link to where you will find the best deals on the Crown. The battle for the best high-powered sub-ohm tank is in full swing, is the Sense Blazer 200 the “Beast” the company has been waiting for? Let’s find out.